So what is the relevance of Two Guitars, Bending Time that features over 50 year-old musicians who have already paid their dues, already been on tour, already been on labels and played in some of the top groups of yesteryear like; The Turtles, The Tokens, Al Wilson, Lou Rawls, Chubby Checker, Leslie Gore, Bobby Day, Ray Charles, Eubie Blake, Snoop Dogg (believe it or not!) as well as jazz artists Jerry Mulligan, Jackie Paris, Sue Raney, Dizzie Gillespie? I am glad you asked; let me sum it up in one phrase “Musical Experience.” What does this add up to? An easy listen, an enjoyable musical experience paying homage to groups and songs they have actually been involved with over the years. The eclecticism is actually the glue that showcases the mastery and wisdom of note choices from these two veteran musicians, Gus Wieland and Brian Conigliaro have put together a well blended jazz influenced offering that will also appeal to the adult contemporary, adult-rock and jazz listener, that prefers quality sounds, playing and execution as well as, well conceived originals that blend well against well known nuggets. 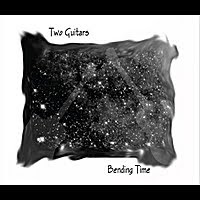 Be the first to comment on "Two Guitars, Bending Time"